There is nothing like a rematch between the two teams that battled to advance to the Super Bowl last season, especially when one team so thoroughly dominated the other. The Minnesota Vikings look to seek revenge against the Philadelphia Eagles on Sunday. Minnesota has lost the last two contests in this series and they are just 3-10 in the last 13, but surprisingly lead the all-time series 14-13. They were supposed to be the story when the Minnesota Vikings took on the Los Angeles Rams, and they did not disappoint as Kirk Cousins and Jared Goff combined to throw for 887 yards and eight touchdowns as the Rams downed the Vikings, 38-31. Minnesota would take the lead on a 16-yard touchdown pass from Cousins to Aldrick Robinson. Los Angeles would tie the score just before the end of the first quarter, but Minnesota would take it right back on a Dan Bailey 37 yard field goal. After Los Angeles it taken lead on a 70 yard touchdown pass by Goff, Cousins found Robinson for the second time in the game, this time for a 17 yard touchdown to put Minnesota back on top by three. Los Angeles would answer with two straight touchdowns, both through the air as Goff added his third and fourth touchdown throws of the first half. Bailey would add a 39-yard field goal just before the half ended and Minnesota trailed 28-20 heading to the locker room. Los Angeles would get the first points of the second half on a 34-yard field goal, but Cousins with throw his third touchdown of the game, a 45 yarder to Adam Thielen to cut the deficit back to three. Goff responded with a 31-yard touchdown pass to Robert Woods, his fifth of the game. Minnesota would get a Bailey field-goal, his third of the contest but they would get no closer than seven points. Cousins had a great game, completing 36 of 50 passes for 422 yards and three touchdowns. Thielen had 135 yards receiving while Stefon Diggs had 123. The Vikings are 12th in the league in yards per game at 390.2, and they are 20th in average points per contest at 22.5. On defense, Minnesota is 21st in the NFL in yards allowed per game at 381.5 and they are 22nd in points allowed at 27.5. 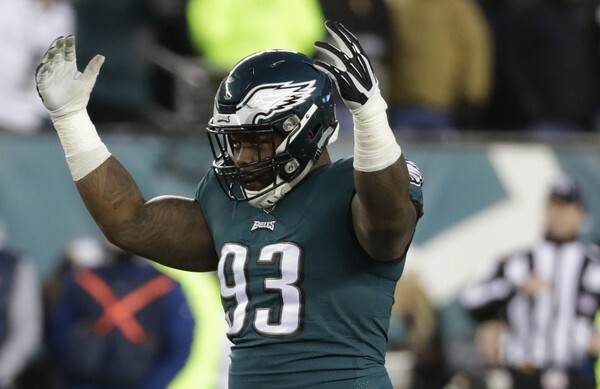 The Philadelphia Eagles are finding that trying to repeat as Super Bowl champions is not an easy task, as they lost to the Tennessee Titans in overtime, 26-23. Philly had taken lead on a 37-yard field goal by Jake Elliott, but Marcus Mariota threw a 10-yard touchdown pass to Corey Davis to give Tennessee the victory with five seconds left in overtime. Tennessee had the only points of the first quarter as Ryan Succop connected on a 42-yard field goal to give the Titans a 3-0 lead. Philadelphia would respond with 17 unanswered points. Carson Wentz threw a 56-yard touchdown pass to Jordan Matthews with a little over four minutes left in the half to put Philadelphia on top by four. Jake Elliott then hit a 27-yard field goal as time expired to extend the Eagles lead to seven. The Eagles came out in the second half and got another Wentz touchdown, this time to Alshon Jeffery for 16 yards to make it 17-3. Tennessee responded with a Mariota 3 yard touchdown run before Succop connected on his second field goal of the game to cut the Eagles lead to just four. With just over five minutes left in the game, Mariota threw an 11-yard touchdown pass to put Tennessee up by three. With 16 seconds left Elliott hit his second field goal of the game to tie the score at 20, sending the contest and over time. That is where Mariota proved to be the hero. After Philadelphia used almost 9 minutes of the clock to take a three-point lead, Mariota methodically moved the team downfield, finding Davis for a 10-yard touchdown pass to give Tennessee the victory. The Philadelphia offense has struggled this season, averaging 363.8 yards per game, 20th in the NFL, while averaging 20.5 points per contest, 23rd overall. The defense is 10th in the league, allowing 335.2 yards per game and they are ninth in points allowed at 20.2. 10-4 ATS in their last 14 games in October. 44-21 ATS in their last 65 games overall. 8-3 ATS in their last 11 games in Week 5. 5-0 ATS in their last five games in October. 5-1 ATS in their last six games in Week 5. 13-5 ATS in their last 18 games against NFC teams. The home team is 7-3 ATS in the last 10 contests between these two teams, and Minnesota is 2-7 ATS in the last nine meetings between the two. They are 1-5 ATS in the last six meetings in Philadelphia. The Eagles were just five seconds away from being 3-1 this season. They are playing at home in a game that is almost a must-win scenario for them. Meanwhile, Minnesota has looked exceptionally well on offense but their defense has struggled. This should be a close contest, but it is one that Philadelphia will win by six. This is going to be a high-scoring affair. Neither team is playing particularly well on defense, so don’t be surprised to see a contest very much like the Vikings loss to the Rams.